Here is my layout showcasing a Scrap Shotz monthly kit (of course!) and those yummy Prima Pebbles! If you look in the top right hand corner, I placed my Prima Pebbles there. When I was constructing the layout, it just "felt empty" there and these were perfect! Since then I have gone on to make a list of how to use the pebbles more - here are my suggestions, hope you like them! Flower centres (of course!) gosh they would be stunning! and lastly, I am excited to use them as jewellery on a pendant - stay tuned for this project - it is in its idea phase now!!! Let me know how you use the Prima Pebbles, ok? 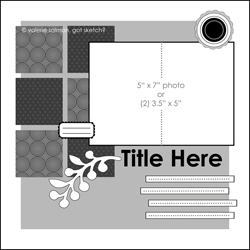 Scrap Shotz February Kit and Add-ons are Up!! Every single month, I say, how can Sandy top last month's kit? And every new month, she does! 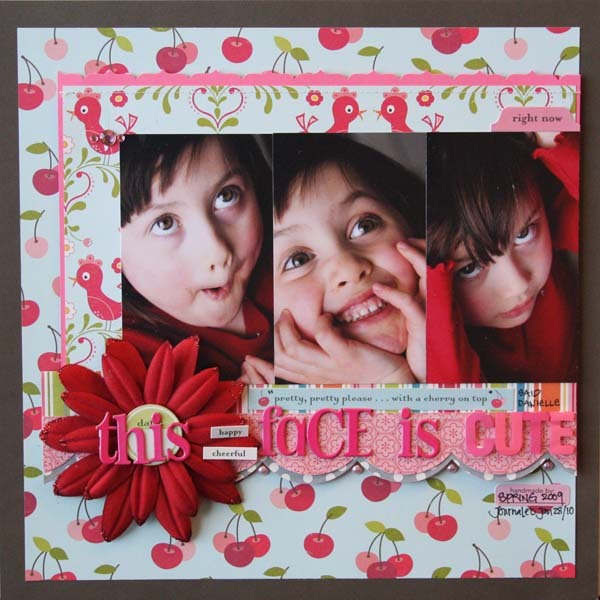 Goodness me, Scrap Shotz's February kit is divine! Have a looksie at what is coming your way Kit Subscribers - and if you are not a Kit Subscriber, what are you waiting for??? The February kit features "Yours Truly" by Echo Park; drool over the beautiful red, white and black hues. 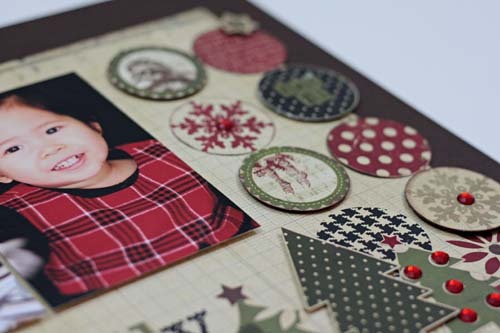 You can round out the kit with the Pattern Paper/Sticker Completer add-on or the Cardstock add-on too. Fabulous Fundamental: Let's Talk Adhesive! Let's talk adhesive! Over the past few weeks, I have chatted about adhesive to various scrappy friends. What I have realized is not all glue is created equal...and if I look into my scrappy supplies, I have a diverse selection! There is no one glue fits all scenario at my house! Tombow Mono Liquid Glue: My personal favorite liquid glue. Why? It cleans up easily with water; it does not wrinkle or destroy the paper I am adhering; it works on wood, fabric and paper and it lasts a long time. Fabulous value! Tsukineko - The Essential Glue: I love the glue itself and the glue pad. 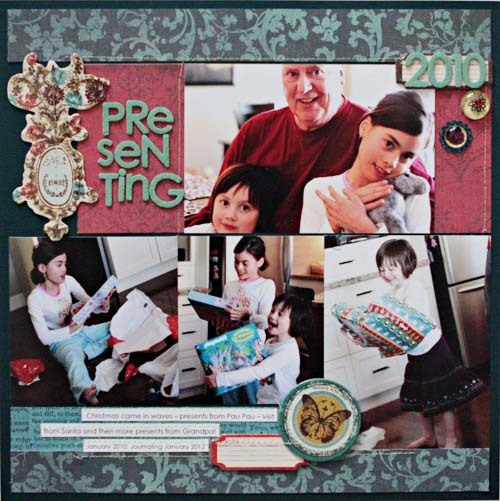 This duo is perfect for foiling and glittering detailed images on your projects. Clearsnap - Glue Gloss: OK I'll admit it - I bought this glue initially because it is just SO darn cute! It has however become a staple in my stash. The sweet mascara like applicator is perfect for adhering light weight ribbon and twine. I keep a tube in my toolbox at all times! Stix2 Glue Gun Refills or the Glue Glider: This is the work horse of my scrappy escapades. I use this glue 90% of the time on my projects. Dotto Dots - Repositionable: So I must have commitment issues but this repositionable dotto dots is a must for me. As I work, I like to temporarily tack down my work and this fantastic product does the trick. Dotto dots is a pre-ordered item so let Sandy know if you are interested. For me, there is nothing else! Have you caught the Smash Wave??? Smash books are hotter than ever. 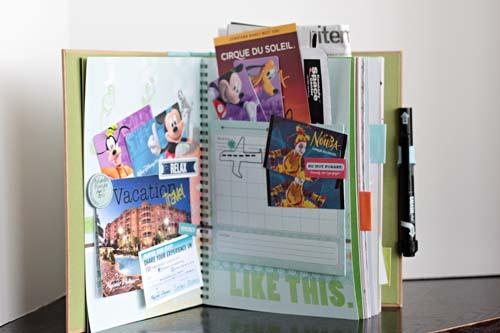 No matter where you go, there are papers, clips, die cuts and more that coordinate with a "notebook" which doubles as a Smash book of course! Here is my Smash book! Suffice it to say, I am in serious love with Smash books, so much so, that I have 4 on the go! And each of my daughters has their own Smash book too! So have you started Smashing? "All in moderation" - when I use multiple pieces of pattern paper, I use small amounts of the various papers so the project does not look confused and overwhelming. I carefully craft my layout so that the photos take centre stage and the pattern papers complement the photos. "Same but different" - to blend the various pattern papers in a pleasing manner, I choose hues and patterns that have the same value, so no one paper or pattern dominates. "Why invent the wheel?" 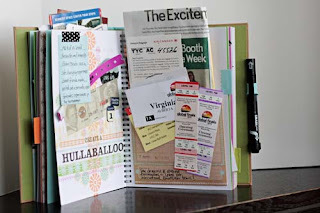 - scrapbooking time is precious in my house. As such, I do not want to spend precious time finding the perfect coordinating pattern papers so I use manufacturer collections as much as possible. They are brilliant! 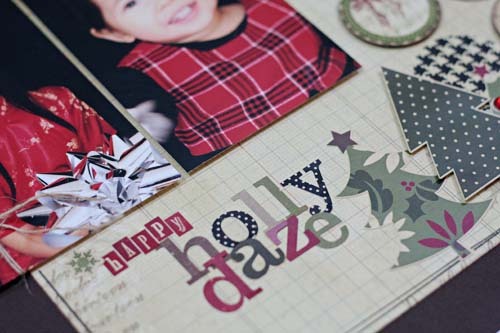 But better yet...about 98% of my layouts are created using the SSZ monthly kits; Sandy is genius! Now let me give you an example or two! Can you spot the 5 different pattern papers from October Afternoon in this layout? Or the 7 Graphic45 pattern papers here? How many pieces of pattern paper do you use on your projects? Throughout the year, I'll post sketches or inspiration for you to create a project. 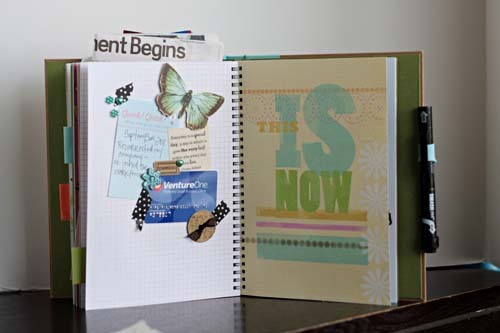 Using the sketch or inspiration, you may create a layout or an altered item or a card or a mini album or...or...whatever your heart desires. 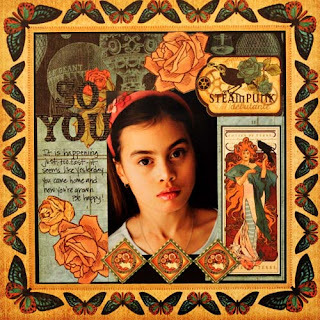 As you can see, Project 12 at Scrap Shotz is wide open; we just want to inspire you to create. The fine print: I'll post the sketch or inspiration the 2nd Tuesday of each month - so you will have one month to create and link your project to me. I will make a draw for a prize and announce the winner when I post the next sketch or inspiration. For the month of January, I chose a sketch from Valerie Salmon of Got Sketch? This sketch is very versatile as you may scrap either 1 photo or up to 8 photos! This sketch is also easily adaptable to a 2-pager by creating a mirror image for the 2nd page. Here is my interpretation featuring the December Scrap Shotz monthly kit. 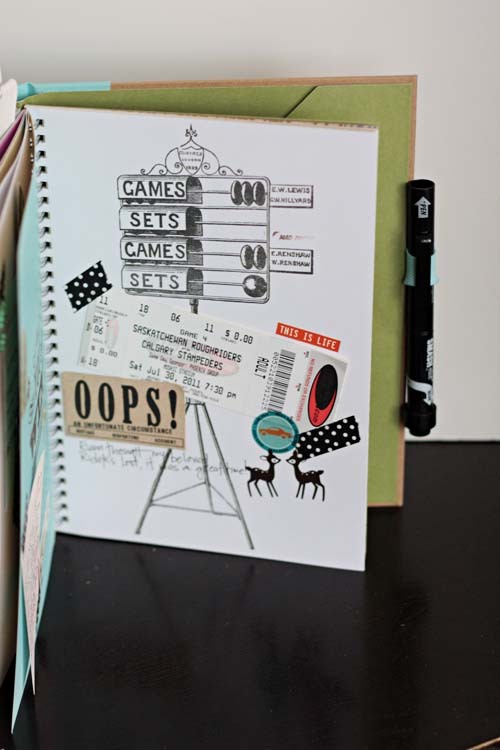 Notice I created a mirror image of the sketch, used circles instead of squares and changed up the journaling. Here are a couple of close-ups of the layout and how I made the sketch and kit my own. Personally I like a lot of texture and dimension on my layouts. This can be easily created using pop-dots to raise some elements. Another technique is to "decorate" the die cut stickers. I also used my Copic spica pen to add a "frame" around the layout. The wonderful trait of the Spica pen is its subtle glitter of the ink - it was perfect for my Christmassy layout! Let's see your Project 12 of 2012!!! I hope you will join me each month for Scrap Shotz's Project 12 of 2012! Please post your Project 12 layout in the comments section to be eligible for a blog prize! Happy New Year! Welcome to 2012 - let's start the year with an awesome reveal from the Creative Team! 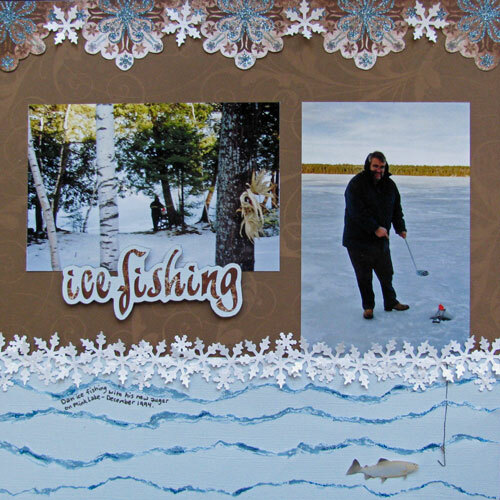 From Gail, we have this fabulous layout; don't you love the border and the inked edge water? Jennifer whipped up these eye catching cards - the details are breathtaking! 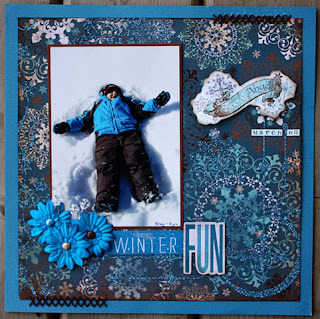 This stunning layout was created by Lorraine - love the dimension and texture on this layout. 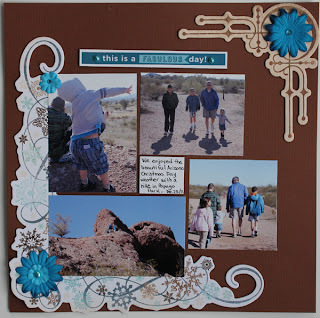 Love Rosie's creativity and eye for detail on this layout - the layout is simple yet extravagant - absolutely beautiful! 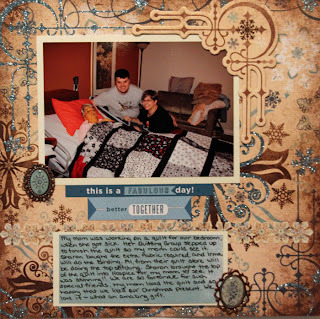 Wendy created this beautiful and poignant layout about her Mom's Christmas quilt - stunning - love how she used the accent as a "photo corner." 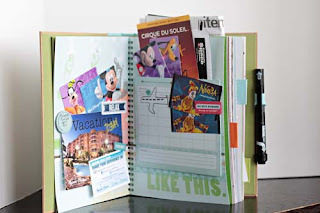 January is traditionally a month of organization so this month's challenge is, of course, Organization! Give me your best scrappy organization tip and I'll include your name in a draw for a blog prize :-) One entry per person please. I'll draw for the prize on January 31, 2012 at noon MST. From everyone at Scrap Shotz, we wish you all joy, health and prosperity for 2012!